The last step in my 6 step planning process is to add extra magic to your trip. 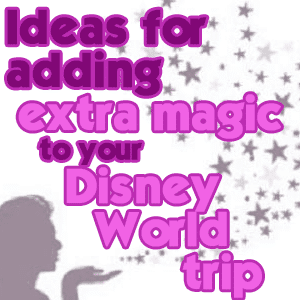 Today, I have some ideas for how to add extra magic to make your trip even more fun. Although it is definitely optional, it can often help create memories that your family will never forget. I also have a quick tip on avoiding some crowds at Magic Kingdom as you walk down Main St.
Bring some glow sticks to Disney World with you and hand them out to kids along the parade route. Or bring little party-sized bottles of bubbles and hand those out (or just blow bubbles in the direction of some kids who might be having a hard time waiting and would be entertained by it). Or anything else you can think of that would be fun to hand out and make somebody's day better. Playing Tinker Bell is sort of like being Santa Claus during your trip. The idea is to have gifts arrive each day from Tinker Bell which may or may not be tied to a few rules you set beforehand. Some ideas for gifts include water toys for a water park day, glow toys for a day when you'll be out at night, Disney shirts that you bought before your trip, new pajamas (Target often has Disney PJs), Disney gift cards so kids can buy their own souvenirs or a pressed coin book to collect all of the pressed coins that you get throughout your trip. Not only can this encourage good behavior but it can save money on souvenirs since you're buying things before you get to Disney World. There are lots of things at Disney World that you can be chosen to be part of like parades, park openings and shows. It takes some luck but you can increase your odds by arriving early, having a good attitude and wearing matching shirts. Read the Williams family blog for stories about things they've been chosen for and tips on how they did it. Fairy Godmailers are people who mail postcards from Disney World to people who will be going at a future date. You can be a Fairy Godmailer and/or receive a postcard from one. This thread on DISboards.com is where you can go to volunteer to be a Fairy Godmailer and ask to receive a postcard. If that thread gets closed for being too long, there will be another opened to continue. My quick tip of the day is that if you're walking down Main St. at Magic Kingdom and the streets seem really crowded, look at the sidewalks to see if they are less crowded. People often stick to the street so the sidewalks can be a great way to get down Main St. with less people around you. Do you have other ideas you could add to my list? I'd love to hear them in the comments. Last trip, I took a box of those large glass jewel paperweights in my bag for the Magic Kingdom. You see, every single time the kids watch MIckey’s Philharmagic, they reach out to grab the jewels Ariel tosses when she’s singing “Part of your world”. So, when they reached up, I put a jewel in their hand, so they thought, even just for a moment, that they’d actually caught one from the movie. The looks on their faces was priceless. My son said it was the most magical thing he’d ever experienced (he’s 15, so thats really saying something!! ), and my niece talks about it anytime disney world is brought up. Oh gosh, I love this idea! I’m 35 and still tempted to try to grab one of those jewels! I am going to do this for my three year old. Thank you for a great idea! Another great AND cheap source for Disney tinker bell gifts is actually iParty or Party City! They have tons of Disney items that are really totally non party related, therefore they’re usually on sale really cheap. We’re leaving in a week for Disney with our 3 yr old princess so I stopped at iParty and hit the jackpot! I got Disney puzzles, stamps, tiaras, tattoos, and more! We did the tinkerbell gifts last year and I think it went over well. The kids got to decorate their special gift bag and I told them that if the listened to us in the parks, then Tinkerbell might leave them something special in their bags. Most of the time the items were cheap stuff I found at Dollar Tree or the Dollar section at Target. Oh and if anyone out there is going this upcoming year, don’t forget to check out disneystore.com on Cyber Monday. They have some great deals on the same stuff you can find at the parks. Bear with me. This will be a ’round about way to get to “adding extra magic” but I will get there. Upon toodling around your site I came across your post “5 cool things I found online.” I followed up on one of the suggestions to get to the Fiverr.com site where I found artofram (http://fiverr.com/artofram/draw-a-cartoon-of-you-in-any-style) who is drawing 12 (yes 12) pictures of each of my fellow travelers either as a Disney Character or with a Disney Character. My son has a penchant for the Cheshire Cat, so I now have a caricature of him as the little pink beastie. I am going to take these funny pics, shrink them down then make resin covered brooches for each of my compatriots to wear proudly in the park. And with a wink and a nod, I’ve added enough of the naughty fairy’s dust to make everyone a little more jolly on our holiday vacation. Now is the best time to get glow sticks! Since it’s Halloween season they are everywhere and available in cool shapes. I picked up a few princess wands and some swords! Also I got some great Tinkerbell gifts from the Disney Store online sale section. Since fall is coming in the summer/ spring stuff goes on sale. This is perfect if you are planning trips early like we are. us since we are not going until may. You are absolutely correct on there being an ABUNDANCE of glow products out right now!